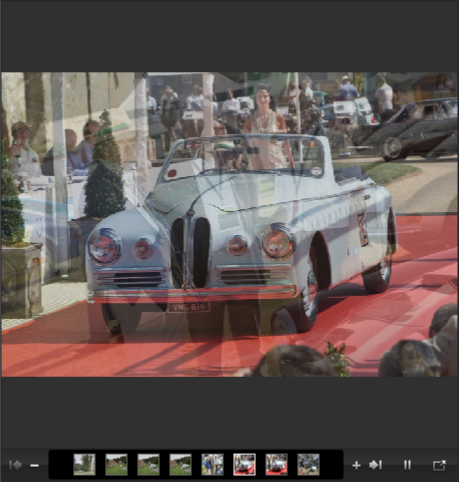 The Bagleys (Sarah & Peter) and David Hayhow very kindly invited us to participate in the 2013 Salon Prive. Salon Prive is the Uk’s answer to the Villa D’Este, and a stunning selected concours de elegance. It turned out to be three days of sunshine, champagne, lobster, and of course fine cars. We met up with old friends and made new ones. All in the convivial surroundings of Syon House and its park. Only on the last day (the Friday) did the heavens open and it rained all day. But perversely, when the time came to take the car home, the skies lightened and the sun just managed to peek out. So the drive home around the car park that is the bottom part of the M25 on a Friday evening was at least dry. We decided to take the optional Tuesday activity, which consisted of getting to the RAC at Epsom and a sumptuous breakfast, followed by a gentle drive through Surrey countryside, arriving at Mercedes Benz World at Weybridge, Surrey. Here we were treated to another fine lunch, and a chance to look around the museum, and view the driving displays. Well actually tyre smoking exhibitions might have been a better description. Finally we were all allowed to take to the mini track and try it out for ourselves. Ever mindful that we were presenting this car the following day, unlike other participants who had brought along one of their “other” cars, we generally behaved ourselves. Then it was on to the Brooklands banking at the Museum for photographs, until it was time to find our way to Chiswick and Syon House. Park up the car in its designated space, and give it a final clean up. There was a grand dinner in the evening, for which we changed into black tie, etc., and were entertained by Derek Bell reminiscing about past exploits. We were very gratified to see that in the 2014 brochure our car was treated to a full page photograph. It very nicely summed up this excellent event for us.